Alcatel MDR-3X18 Repair, 100% Tested, 1-Year Warranty, Unparalleled Free Tech Support, NO Out-of-Box Failures - Period. The Alcatel MDR-3X18 is an important part of the highly successful Alcatel family of microwave digital radios. Capacities of 4 DS1s, 8 DS1s and 1 DS3 are available within this series. This product combines robust technology with the experience and expertise gained from years of developing digital radios and muldems. The result is equipment that provides a practical solution to short-haul, low-to-medium capacity communication requirements. The Alcatel MDR-3X18 is designed for ease of installation and operation. The equipment can be completely installed and maintained without the need for sophisticated and expensive test equipment. 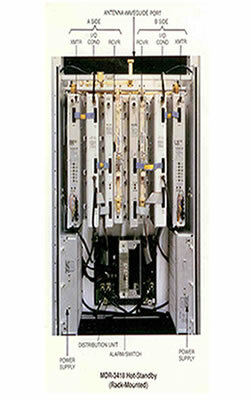 Test points and an RF test port permit the easy performance of all required alignment and maintenance tests.